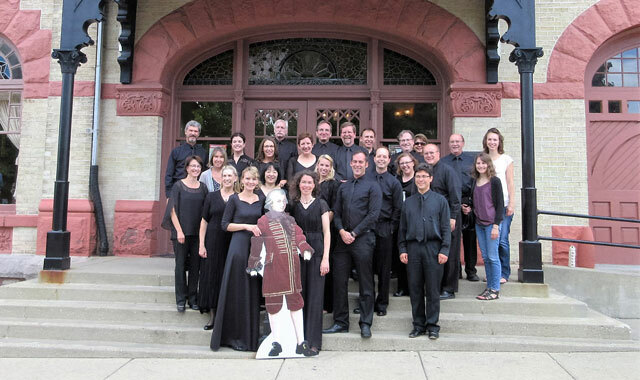 Midwest Mozart Festival musicians stand outside the Woodstock Opera House with a cutout of their organization’s namesake, the composer Wolfgang Amadeus Mozart. One of the greatest musical geniuses in Western civilization is the subject of a relatively new nonprofit organization with a familiar mission. Midwest Mozart Festival Inc., based in Woodstock, was founded last year by a group of professional musicians and music lovers who wanted to keep alive the nearly three-decade old traditions of the now-defunct Woodstock Mozart Festival. The new group’s summer concert series returns this July. Concerts are performed by McHenry County’s resident professional orchestra, a group of 42 musicians who hail mostly from the northwest Chicago suburbs. Many of the musicians forged a longtime relationship years ago, having performed together primarily at the Woodstock Opera House as part of the former Mozart Festival. Groner is gearing up for the summer concert series’ July 30 opening, to be held at the Sanfilippo Estate, in Barrington Hills. Support for this first concert comes from the Sanfilippo Foundation, the philanthropic arm of the Sanfilippo family, whose members strive to educate people about automatic, or self-playing, musical instruments and assist nonprofits through community events and fundraisers. Prior to the first concert, patrons will have an opportunity to tour the Sanfilippo Estate and experience its musical mechanical wonders from the Industrial Revolution. Following the concert, the Sanfilippos invite patrons to ride their 1890 Eden Palais Carousel. Tickets are $50 for the concert and tour. To prepare for the concerts, each musician perfects the music at home prior to three full orchestra rehearsals, each lasting 2.5 hours and held a couple of days before and on the day of the concert. Some out-of-town musicians have to fly in, but most live in the area, like violinist Carol Dylan of Crystal Lake, who’s married to the festival’s board president. Some of these talented musicians have been performing together for more than 20 years. Just into 2016, musicians of the Woodstock Mozart Festival’s orchestra were excitedly preparing for a 30th anniversary gala at the Opera House when they received stunning news. The board of directors had decided to cease operations. The devastated musicians quickly stepped up to form a replacement concert series. The musicians formed an exploratory committee in April 2016 and developed a mission: Concerts, Culture and Community. Their objective was to provide northern Illinois with high-caliber classical music performances, offer a unique cultural experience of fine music to a diverse population at affordable pricing, partner with local businesses, participate in local economic development programs, and support music students in schools by way of reduced ticket pricing and educational programming. A full-time nurse by profession, Dylan is a lifelong classical music lover who became board president in part because of the contagious passion he caught from the festival’s musicians, his wife included. He also had prior experience in forming a nonprofit organization. The group had only 3.5 months to prepare for the gala. In April 2016, the Midwest Mozart Festival was born, and a strategic and aggressive marketing plan, which included a vibrant Facebook page, was launched. Since the group’s predecessor used the Sanfilippo Estate for prior concerts, it was only natural for this new entity to reach out. The organization already has formed a relationship with the Woodstock School District for mentoring young musicians. The orchestra’s members, about 70 percent of whom are also educators, travel to a high school or individual private program to practice and rehearse with students before joining them in a “Side by Side” concert. The first concert was held this Jan. 21 at the Music Academy in Rockford. “It’s a concept that allows these young people to bring themselves up to a different level when they play,” Dylan says. A monetary grant from the McHenry County Community Foundation enabled Midwest Mozart Festival to invite 22 young musicians to a concert at no cost. “We want to offer free or reduced-price tickets for students to come to our concerts, so they can fall in love with classical music,” Dylan says. According to Groner, a onetime violinist, the goal is for concert patrons to enjoy the great diversity of music and appreciate the vast amount of music from Mozart’s repertoire. Tickets for Concert I can be purchased online at sanfilippofoundation.org. To purchase tickets for Concerts II and III, visit woodstockoperahouse.com or call (815) 338-5300. For more on Midwest Mozart Festival, visit midwestmozart.org. This entry was posted on Tuesday, July 18th, 2017 at 12:00 pm	and is filed under Arts & Entertainment, Top Posts. You can follow any responses to this entry through the RSS 2.0 feed. Both comments and pings are currently closed.